Here it is. Or just skip the graphics and download the data in Excel here. I can’t say I care much about most of it. Of course most people everything think corruption is “increasing,” because they are a grumpy lot. Below is a quick table summarizing the results from the most notable countries (no comment where it’s pretty much “as expected”). China n/a 🙁 Last survey was 9%, haven’t been included in this year’s GCB at all. Greece 22 By far the worst old-EU country; up from 18% in last survey. India 54 “India shining” worse than many African countries. Exactly same as in last survey. Italy 5 Down from 13% in last survey. Japan 1 Down from 9% in last survey. This figure much more believable, I daresay. Pakistan 34 Cleaner than India! 😐 Down from 49% in last survey. South Africa 47 WTF? Thought RSA, though kinda Third World, had a First World administrative structure. Taiwan 36 WTF!?! Is this a statistical fluke?? Turkey 21 Down from 33% last survey. Ukraine 37 Virtually same as in last survey, when it was 34%. United Kingdom 5 Strange… was 1% in last survey. Venezuela 27 Quite typical for middle-income country, contrary to anti-Bolivarian propaganda. So what’s up with South Africa? 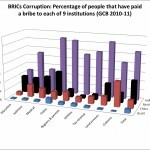 It’s corruption increased by an order of magnitude relative to the last GCB. And Taiwan?!? It’s GDP in purchasing power terms has recently soared past Japan’s, but it’s corruption levels are Third World… assuming this isn’t a bizarre statistical fluke. 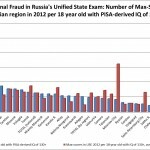 A pity that there is no data for Russia and a few other key countries (Brazil, China, Germany, France). This will make the update to the Corruption Realities Index incomplete, and will leave a gap in my data series for bribery incidence in Russia. I have written to Transparency to inquire as to whether data for these countries will be forthcoming at some later date.